And, indeed, others have imagined. 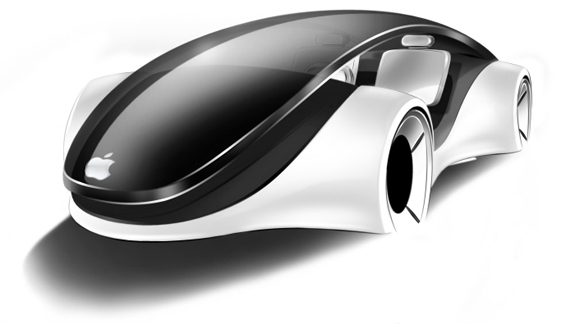 Below we’ve featured three versions—two concepts and one retrofit—of what an Apple iCar might look like. As for the possibilities of a real life iCar, there have been rumors to that effect for years. Volkswagen and Apple reportedly had serious discussions of a developing a car together back in 2007. Others have predicted some sort of merger or joint venture between Apple and electric car manufacturer Tesla—both companies are innovative, designed-centric and based in the San Francisco Bay area. Sadly, Spot Cool Stuff thinks the chances of Apple actually bringing an iCar to fruition are remote. What we do find plausible is Apple venturing into the in-car electronics market—audio and navigation systems, for instance. That’s an area both Google and Microsoft are already going after. We’d love to see Apple do the same. 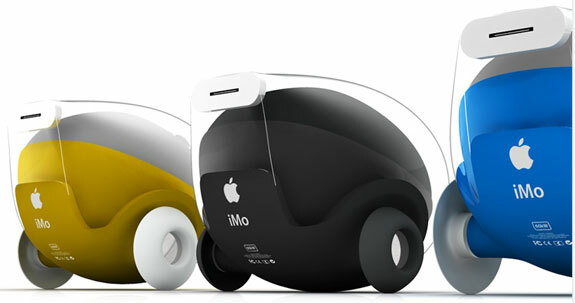 Our favorite mock-up of an Apple automobile comes from Italian industrial designer Franco Grassi. His version of an iCar doesn’t look particularly practical, especially the way in which the driver would sit above the steering wheel (or steering oval, as the case may be). 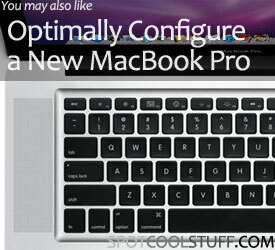 We do like how the silhouette has an Apple sensibility, looking very much like an oversized Magic Mouse. 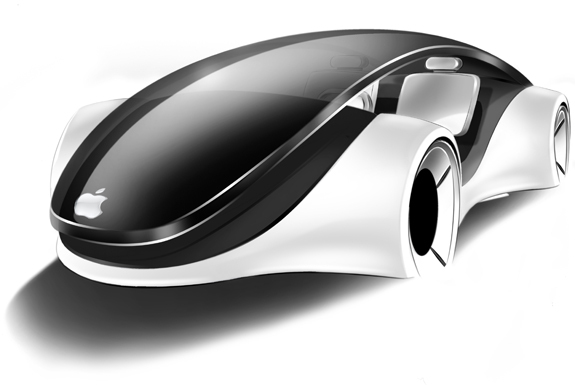 Design consultant and car artist Anthony Jannarelly called his concept of an Apple car the iMo. In addition to creating a concept design he also built an excellent spoof website for the iMo and mocked up a few TV commercials (see example, below). Jannarelly envisions an Apple iCar to be a two-person, two-wheel pod vehicle capable of communicating with other cars, parking itself and driving itself to pick you up. That vision might be theoretical but the technology and design behind it is not. 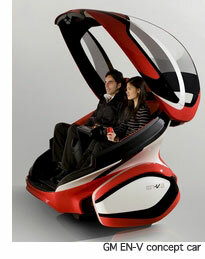 It exists today in the very real EN-V concept vehicle built by General Motors. Spot Cool Stuff has personally test driven an EN-V, which employs gyroscope technology similar to that used on a Segway. The ride was smooth and the acceleration responsive, but the vehicle is far from being capable of dealing with ice, potholes, steep hills and other features of driving in the real world. Jannarelly’s iMo, we think, would face similar obstacles. Brabus, a high-performance aftermarket car tuning company based in Germany, has built wondrous custom versions of the Tesla Roadster and Smart Car. 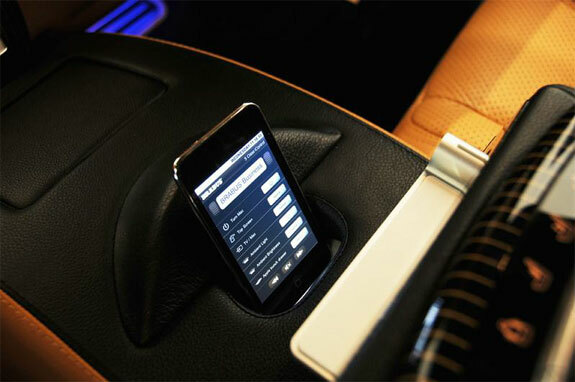 But our favorite Brabus vehicle is their Apple-ized Mercedes S600. 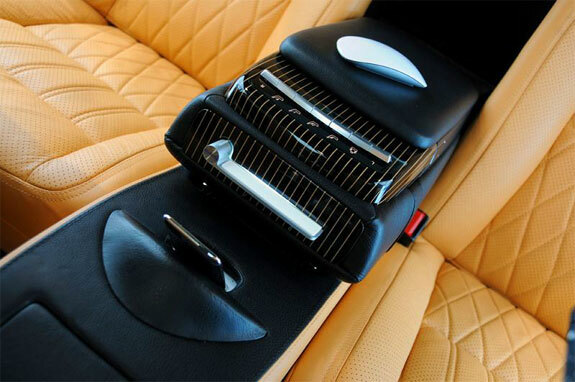 In the rear of the S600, Brabus constructed a sliding shelf that houses a Mac Mini linked up to a 15.2-inch TFT touchscreen in the center console. 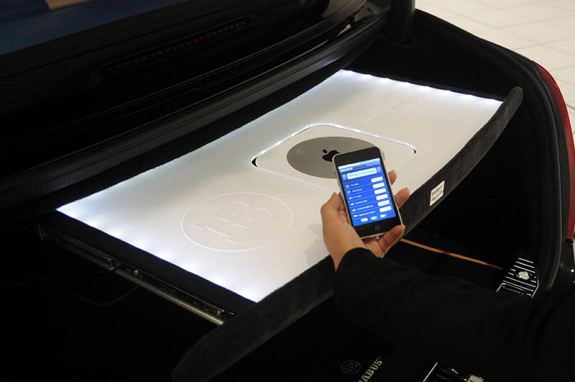 That computer, which is also paired with a Bluetooth keyboard and mouse stowed in the center armrest, powers the car’s navigation, entertainment and climate systems. 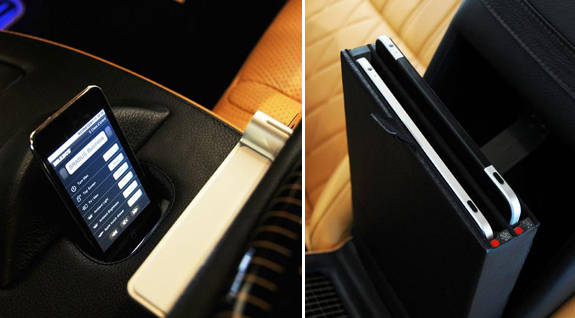 In the back seat there’s a compartment that holds (and charges) two Apple iPads. 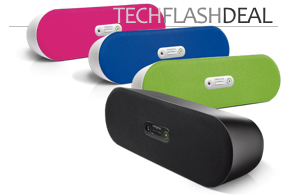 Passengers can place them on specially designed tables with built-in Bluetooth keyboards that flip up from the seat backs. The iPads, and all the car’s audio, can be enjoyed via Bluetooth headphones. Of course, there are plenty of iPod docks and power cords too. It is all very cool, though we’re not sure how wise it is to have this many distractions in a car capable speeding at more than 200 mph. I really don’t think that Jobs would want to invest in an Apple car, but i have to admit that these prototypes are little jewels.